Every year we run a number of awesome films. lectures & events in the Autumn at The Climbing Works. We do it to showcase interesting climbing features that you, our regulars, would not get the chance to see otherwise. The Reel Rock tour is a prime example. We were the first people to show it in the UK 6 years ago and we've shown it every year since to full audiences. 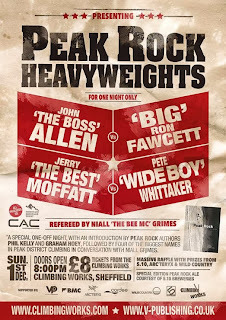 Reel Rock 8 Tour, screening 2: Sun 3rd November. Well received by a full crowd last night, here's your chance to see what you missed when your friends start telling you about it. For those not venturing to the damp lakes for films you can watch the screening of the eagerly anticipated latest from Alastair Lee and colleagues. Leo Houlding and team venture into the cold depths of Antartica to attempt to climb a stunning, unclimbed line. A book in the making for years and what a book. A detailed look at the history, and its leading players, of Peak District rock climbing. From early pioneers to recent heroes, encompassing it all - grit, limestone, trad, sport and bouldering - it's all in there. The night itself will have 4 leading players from the 70's onwards - John Allen, Ron Fawcett, Jerry Moffatt & Pete Whittaker - onstage. 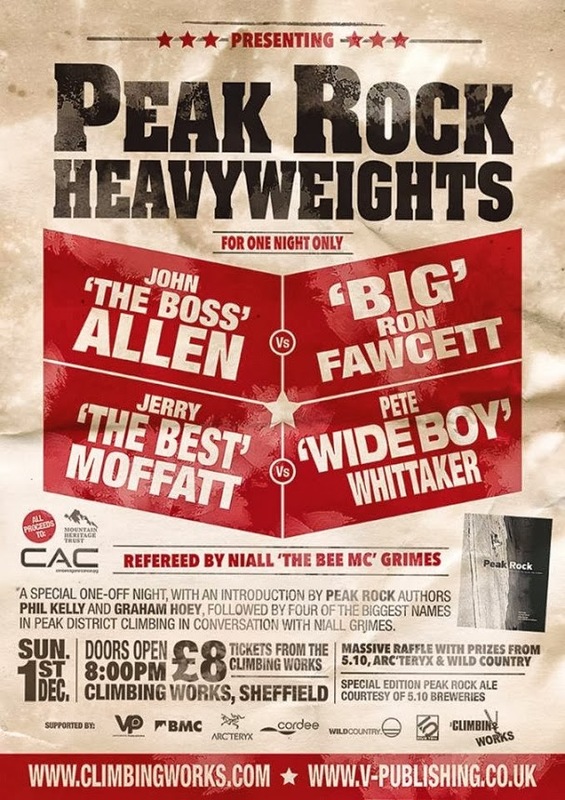 Legends of the sport, and not just in the Peak Distirct, this will be a one-off chance to hear them on stage being interviewed by Niall Grimes.